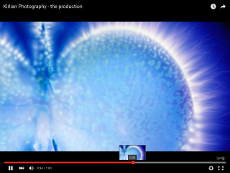 Fullspectrum – Kirlian – What are we photographing? Home > What are we photographing? What phenomena is being revealed by radiation field photography? Semyon and his wife Valentino Kirlian described their photography as a visual method of converting the non-electrical properties of the subject photographed, into electrical ones. Inyushin, a Russian scientist, in his 1968 paper opted for the term ‘bio-plasma body’ to describe the emanations of the subject, telling research scientist, Dr Thelma Moss, that he conceived the ‘bio-plasma’ body to be similar to the aura or astral body. Viktor Adamenko, a Russian physicist, who grew up living next door to the Kirlians, and collaborated with them on many occasions, suggested the process was demonstrating the cold emission of electrons and could deliver meaningful information about the nature of the subject being photographed. Many American scientists translated the term cold emission of electrons into the more familiar corona discharge and as such believe this photography reveals nothing but a commonplace electrical phenomenon that could be explained by the laws of physics alone. Adamenko found an English journal of biological photography in a Moscow library containing an article by the Czechoslovakians, Pratt and Schlelemmer that describes their work in 1939 with electro-photography. Platt and Schelemmer wrote “There can be no doubt about the complex nature of the radiation pictured on the photographic material. The visible and ultraviolet rays are present and xylonite, an English fabric, which is impermeable to infrared, visible and ultraviolet radiations, did not hinder reproduction of the corona.” They went on to say that “surely an unknown radiation produced by this photography is worthy of study”. 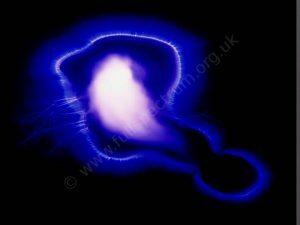 Researchers, Hutchings and Mason, while working together in the 1980’s on the development of a new Kirlian system, posed the question, that as electrons are very light particles, could it be possible that they are deflected by the radiating energy fields of the subject as they make their way to earth, not dissimilarly to the way that iron filings are deflected by the magnetic field around a magnet. Electrons emit photons of light and these light traces are left behind on the photo- sensitive film or paper or, more recently, captured digitally by Fullspectrums JAK2000. Could the corona discharge be illuminating the field? Why do we photograph the hands and feet? 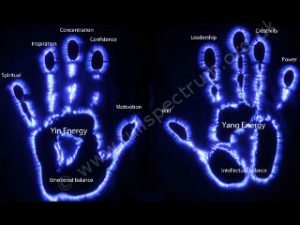 In Kirlian photography the hands and feet are studied as they are well served with nerve endings that reflect micro-changes in energetic properties of the mind and body. It is thought that electrical activity generated within the left lobe of the brain reflects itself in the right hand and that right lobe activity is reflected in the left hand. It is known that nerve fibers from the right hemisphere of the brain cross over and exercise some control over the left side of the body, as do fibers from the left hemisphere cross over to the right side of the body. A Kirlian electro-graph is thought to reflect the mind and body’s electrical activity in the electromagnetic fields around the body. The hands and feet are perfect windows for looking into this activity. Kirlian researchers linking psychological profiles with Kirlian electrographs have mapped the areas of the hands and feet providing a fertile ground for research. One understanding of the Kirlian interpretation is that the vital energy body should fit the physical body like a glove. Holes, gaps, congestions and imbalances are signs of interruptions in the energy flow and indicate disparity between mind, body and spirit. While a continuous, smooth, even energy flow points to balance and equilibrium. These energetic signatures are made visible through the Kirlian electrograph process.